I used to work at my cousin's coffee shop and she was the baker of the most delicious scones. I no longer work or live close by so I don't get to enjoy her scones very often. 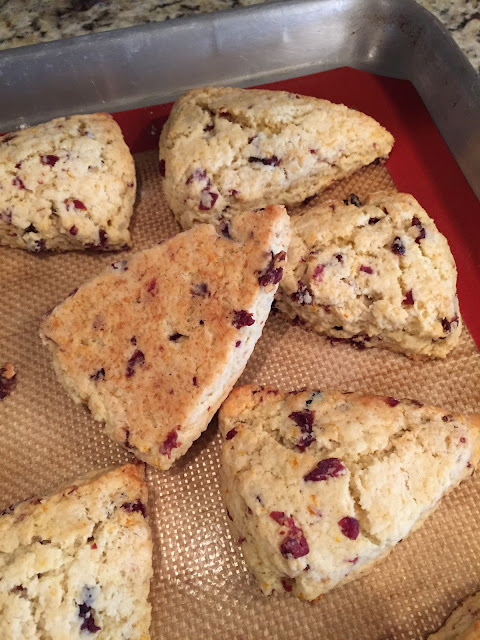 The scones that I've tried at our local coffee shops always fall short, they're dry and not flavorful. 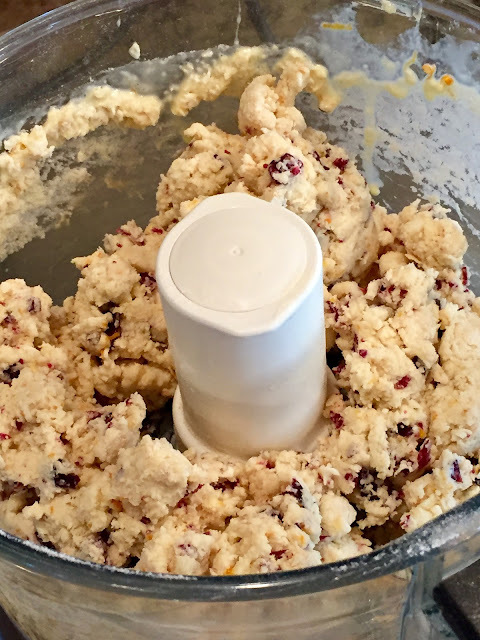 So, I set out to find a scone recipe that was flavorful, tender and would freeze well. Well, this recipe is all that and easy to make. I also like that right out of the freezer they take about 15 minutes to thaw and are ready to enjoy with a cup of coffee. This recipe is slightly adapted from the wonderful blog, Pinch My Salt. 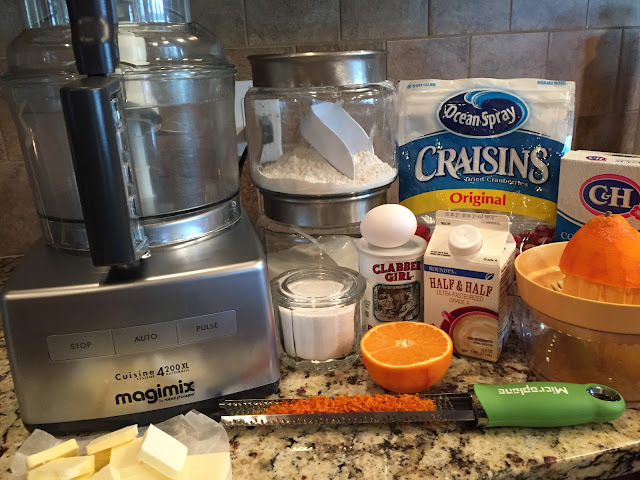 What makes this recipe quick and easy is using a food processor. Make sure your butter is well chilled. Pulse in the butter only until it's mixed in but still pea-sized clumps. Dough will be sticky but turn out onto floured surface and use floured hand to knead into two 6 inch circles. 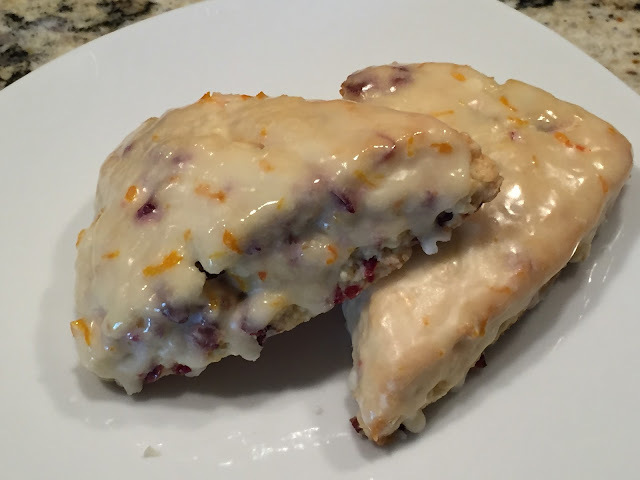 If you like a less sweet scone, these are great as is but for me I'll always go for the glaze! The glaze is thin and will dry and set so you'll be able to stack them in a container without them sticking together. If you used a large orange like I did, you'll get to enjoy the extra fresh orange juice after you're all done. After the glaze dries and sets you can stack them in a container to eat later or freeze them. I do like to put parchment or wax paper between the layers when frozen so they won't stick together. 1. Preheat oven to 425 degrees and line a baking sheet with parchment paper or silpat. 2. 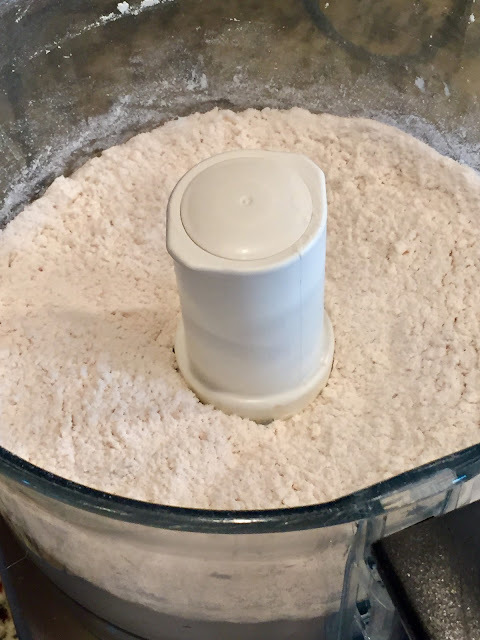 In a food processor, mix together the flour, baking powder, salt, and sugar by pulsing a few times. 4. 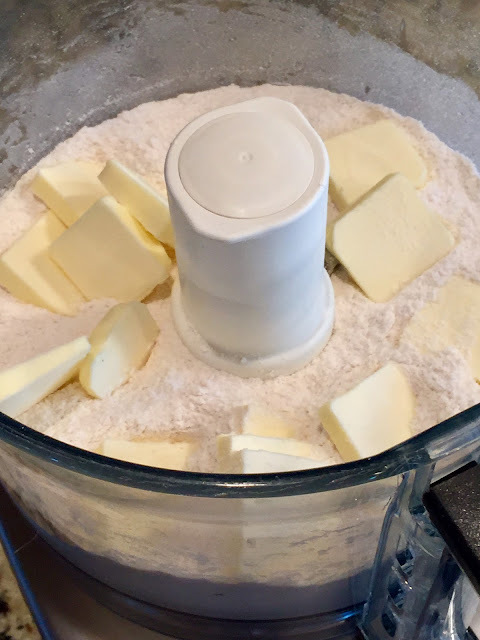 Add cold butter pieces into the flour mixture and pulse 6-8 times, you want the butter to be pea-sized clumps within. 5. 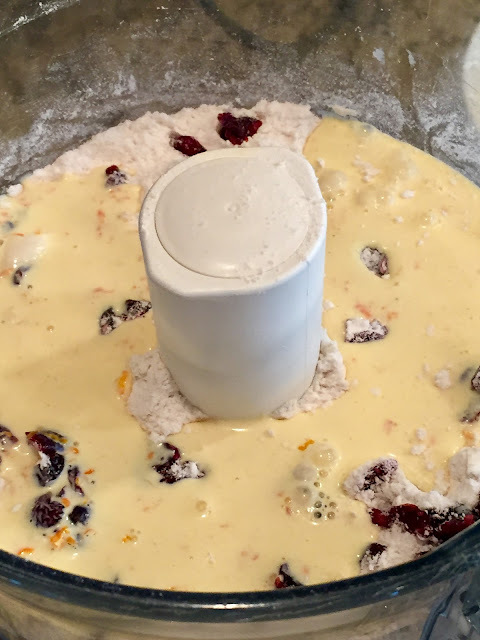 Add the cranberries and the egg mixture to the flour mixture all at once and pulse until the mixture starts to clumps together. Dump mixture out onto a floured work surface and, with floured hands, gather into a ball and knead once or twice. 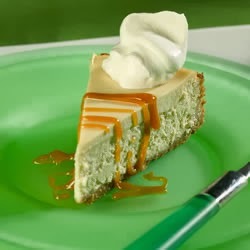 If it’s quite sticky, just sprinkle a little extra flour on the counter and on top of the dough to keep it from sticking. 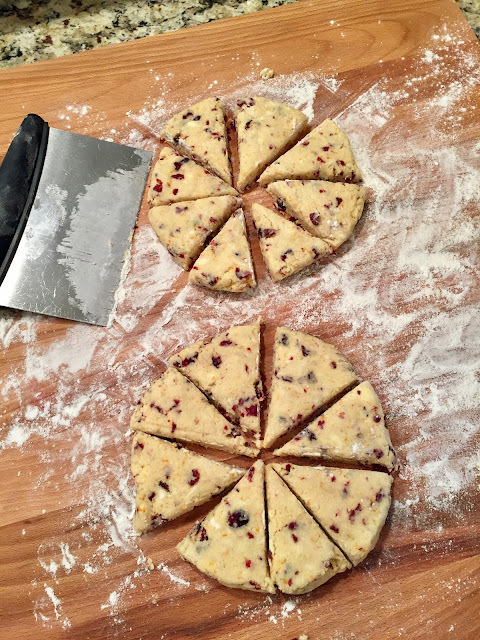 Cut dough into two equal pieces and pat each into a 6 inch circle about 1/2 inch thick. Cut each circle like a pie into 8 slices. 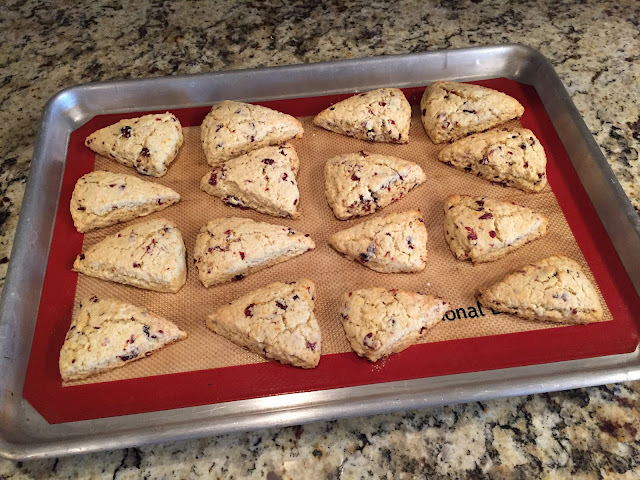 Arrange scones on the parchment-lined baking sheet. 7. Bake in a preheated 425 degree oven for 10-12 minutes or until lightly browned. Remove to a cooling rack and let cool completely before dipping in the glaze. 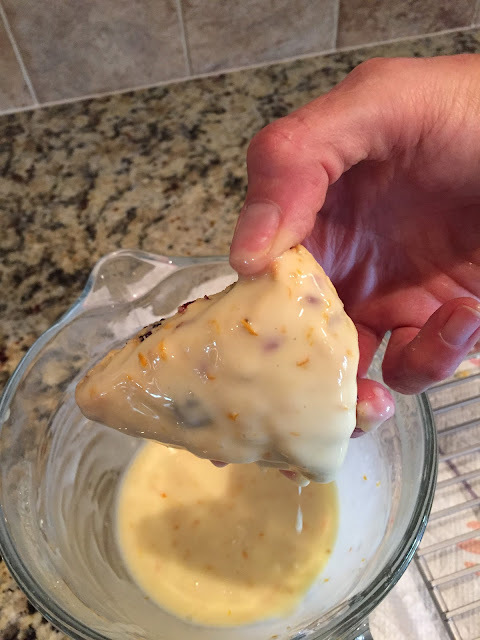 In a small bowl that is wide enough to dip a scone, combine 1 cup powdered sugar with 2 tablespoons orange juice and the reserved orange zest. Whisk until smooth. Put some waxed paper or foil underneath the cooling rack to catch dripping glaze. 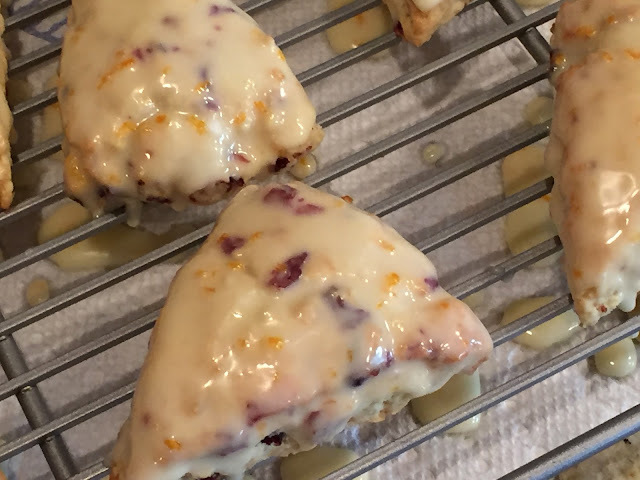 Dip tops of the scones in the glaze and place them (glaze side up) on the cooling rack. 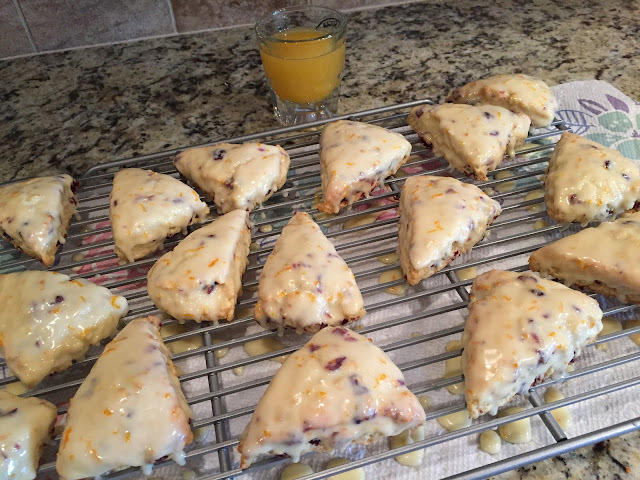 Once glaze is dry, scones can be stored in a container or freezer. If not eaten the day they are made, put them in the freezer. Right out of the freezer they will thaw in about 15 minutes. * Sometimes I don't have unsalted butter so I'll use regular salted butter and just add a pinch of salt instead of 1/2 teaspoon.